Heading to the beach this summer? There’s a few things to think about when it comes to food safety while you’re soaking up the rays. Use an insulated cooler or Esky to transport your food, packed with frozen ice packs or frozen foods to keep things cold. Things to keep cold include meat, poultry and seafood, both raw and cooked. Other foods that need to stay chilled include salads, cut up fruits and vegetables and any fresh dairy products. Stack your cooler safely. Store any raw meats (e.g. steaks for the BBQ) at the bottom of the cooler, and in a separate container, to avoid any juices dripping onto other food. 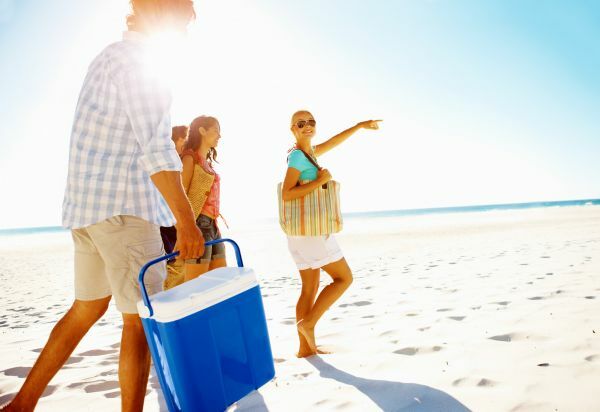 Keep your cooler in the coldest part of the car when driving to the beach (out of direct sunlight). If running water isn’t available near your chosen picnic spot, ensure you’ve got hand sanitiser available, or your own hand washing facilities. Pack a picnic rug or plenty of towels, so you can set up a sand-free zone for preparing your food. When planning your menu, think about choosing uncomplicated and simple foods that require very little assembly at the beach. Think sandwiches or wraps, pre-cut fruits and veggies, nuts or muesli bars. Choose a position out of the sun for your cooler. Avoid opening and closing your cooler frequently as this will increase the temperature quickly. Having separate coolers for food and drinks can help with this. Serve cold food in small portions and keep the rest in the cooler until required. Wash your hands before preparing or eating any food. Keep your plates, platters and utensils clean. Don’t reuse any plates or utensils to serve food that has previously held raw meat, poultry or seafood, to avoid cross-contamination. Australian summers are something to be enjoyed! Reduce your risk of food borne illness by following these simple tips.